A sequence of 12 prints, where the metal bed of a printing press was inked and printed intaglio. The orientation of the paper for each printing was turned slightly to produce a full rotation over the series of 12 prints. The installation of this work included the same pressbed used in the printing of this work. It was removed from the press and leaned against the wall for the first part of the exhibition, then removed and returned to the press, leaving a marked outline, for the remainder of the exhibition. 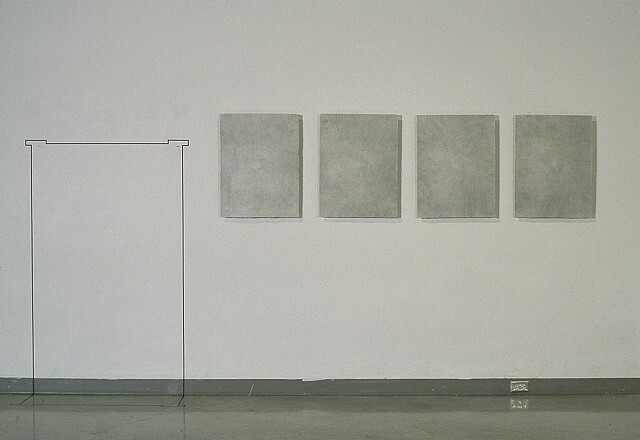 ArtLab Gallery, University of Western Ontario, 1999.